On 1st May 1854 the Emperor Napoleon III re-established the Imperial Guard. Draw the army closer to the new Empire. Be the finale battle-field reserve (although the Guard was more often used as shock/storm troopers leading attacks). Article 7 of the formation decree stated that the Guard was to recruit from active soldiers (soldats en activite) who were in the last year of their conscription and had good conduct and were willing to renew their conscription ( rengagement);NCOs would lose their rank (galons) unless they had the Legion d'Honneur or the Medaille Militaire. Recruits had to be aged under 35 but soldiers over 35 could volunteer to join the Guard for a period of three years - for which they had to pay! There was no minimum height for Voltigeurs or Chasseurs or the Bandsmen (Musiciens). 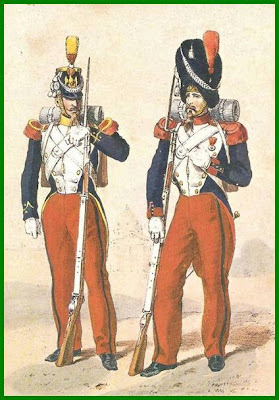 Every Line Regiment was to send 20 Grenadiers and 10 Voltigeurs to the Guard Each regiment of Chasseurs was to send 20 1st Class Chasseurs and the Dragoons, Cuirassiers and Carabiniers were to send 20 men each to form the Cuirassiers of the Guard. The Guides of the Guard had been formed in 1852 from the Guides de l'Etat Major. However, there was some difficulty in getting men tall enough! There was considerable shuffling about of men of the requisite height to form the new Regiments, so that a tall Artilleryman might find himself a Cruiassier (for example) and the Cuirassiers and Carabiniers actually furnished 20 men each for the Grenadiers a Pied who met the minimum height. In 1857 the minimum height and service requirements for the Guard were altered. The Imperial Decree of 17th June stated that potential recruits for the Guard had to have served for four years and have at least two years of good conduct. Drummers, Trumpeters, Buglers, Bandsmen were all exempt from the minimum height requirement, as were volunteers to the Guard. Volunteers were either soldiers over 35 who wanted to enlist, and were willing to do so for a period of 3 years minimum (with no exception) and were of good military character and morals. Civilians volunteers could also enlist, so long as they were from a good family, had a military virtue and could pay for the privilege! NCOs who wished to be admitted into the Guard had to have spent at least one year in their rank and meet the minimum height requirement; the only NCO not to have to meet that requirement was the Sergent Instructeur de Tir.